Almost 13,000 representatives of the global sportfishing community converged in Orlando, Florida for the 58th International Convention of Allied Sportfishing Trades, better known as ICAST. The world’s largest sportfishing trade show is the cornerstone of the industry and is the showcase for the latest innovations in tackle, gear and accessories. Many of the Cuda Pro Staffers attended the show like Bob Izumi, known from the syndicated television show Real Fishing, and Mariko Izumi of the World Fishing Network’s Hookin’ Up. Several captains from the National Geographic Channel’s hit series Wicked Tuna including TJ Ott and Paul Hebert attended as well and were there to promote the brand and provide insights regarding how Cuda improved their fishing performance. All these stars added to the excitement and attracted many more visitors. Many exhibitors and attendees commented that Cuda had the busiest booth at the show. 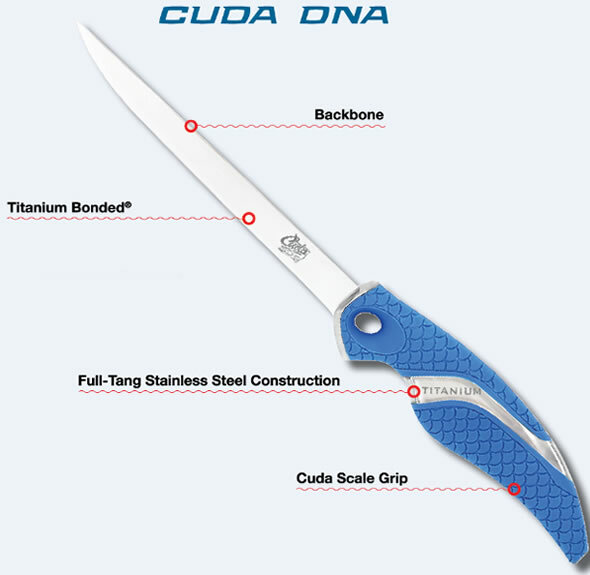 The Cuda tools are created with a breakthrough design that allows the angler to actually see that the knife has a full tang construction. Moreover, the tools are manufactured with Acme’s patented Titanium Bonded technology making them three times harder than untreated options, and they’re equipped with Aluminum Alloy and Tungsten Carbide, guaranteeing the ultimate in performance. In fact, Cuda guarantees all of its tools with a lifetime warranty! In addition, a “Professional” line of knives featuring full tang USA CTS 40A stainless steel blades with titanium-ceramic non-stick coatings and 47-layer compressed, cold-molded, micarta handles were launched at the show. Finally, a first wave of clothing items will be for sale as well. To ensure the highest quality and reliability of all Cuda tools, they are rigorously tested by the fresh and salt water Cuda Pros. So far, twenty-eight Pros have been hand-picked for their fishing accomplishments and dedication to the fishing community, and more are being added. Jimmy Johnson, for example, a football icon, Emmy-winning commentator, and fishing enthusiast, recently joined the Pros team. He’s known to be the first person in football history to win a national collegiate title as a player, serve as head coach to a NCAA championship team, and lead an NFL team to two Super Bowl victories. Next to helping design and develop new Cuda fishing tools, these Pro’s are true evangelists for the brand. They use the tools at fishing tournaments or on their TV shows and they help spread the word on Cuda on their Facebook, Instagram, Twitter and YouTube channels. All in all, they are very helpful to build brand recognition. Despite competition from video games and other similar activities and increased urbanization, recreational angling remains one of the largest outdoor recreational activities in the United States. According to the 2011* National Survey of Fishing, Hunting and Wildlife-Associated Recreation, the U.S. counts more than 40 million licensed anglers. To put this number in perspective, more Americans fish than play golf (21 million) and tennis (13 million) combined. The anglers generate over $46 billion in retail sales with a $115 billion impact on the nation’s economy creating employment for more than 828,000 people. * The survey is conducted every five years by the U.S. Fish and Wildlife Service (USFWS). Since its launch, a little over a year ago, Cuda has greatly exceeded expectations in both brand acceptance and placement at retail stores. There is no doubt that it will continue on this growth trajectory as it seems to appeal to everyone in the fishing industry. Backed by the Cuda Pros, who use the Cuda tools during tournaments and on their popular TV shows, big box and sporting goods stores continue to build interest in these high-quality tools. Recreational fishing is big business with a $46 billion annual market. There are 40 million licensed anglers in the United States alone. Cuda will soon expand distribution in Canada and Europe as well. Specific sales numbers won’t be released for the brand, but based on its reception and the vast market, we expect it to become a solid contributor to Acme United’s financials over the coming years.